A ceremony obligatory on one who offered an animal sacrifice. The regulations governing its observance were as follows: The owner of the sacrificial victim (Sifra, Wayiḳra, v. [ed. Weiss, 6d-7a]) was required to lay both his hands with all his might between the horns of the animal just before it was killed (Maimonides, "Yad," Ma'ase ha-Ḳorbanot, iii. 13). The act of imposition, which took place in the court of the Temple where the victim was slain (Men. 93a, b; Zeb. 32b-33a; Maimonides, l.c. iii. 11-12), was to be performed with bare hands, and there might be nothing between them and the head of the animal (Maimonides, l.c. iii. 13; Men. 93b). During this ceremony the sacrificer, in case he brought a sin-offering or an offering of atonement, confessed his sins, saying: "I have done thus and so, but have repented; may this sacrifice bring me forgiveness and be an atonement for me" (Yoma 35b; Maimonides, l.c. iii. 14). In the case of a thank-offering or a meal-offering at which sins were not confessed, the sacrificer recited hymns and prayers of thanksgiving during the act (Maimonides, ib.). Semikah was observed only when sacrifices were offered by Jews, not when brought by Gentiles (Men. 93a; Maimonides, l.c. iii. 5). The ceremony was not observed, however, when the sacrifice was a fowl (Giṭ. 28b; Maimonides, l.c. iii. 6), nor was it performed,except in two cases, at communal sacrifices (Men. 92a, b; Maimonides, l.c. iii. 10). It was observed, on the other hand, at all sacrifices offered by an individual, except that of the paschal lamb, that of the first-born, and that of the tithes of cattle (Men. ib. ; Maimonides, l.c. iii. 6). Only the owner of the sacrificial animal might observe the ceremony, and it might not be performed by proxy (Men. 93b; Maimonides, l.c. iii. 8). In case, therefore, several persons made an offering in common, it was necessary that they should lay their hands in succession on the head of the victim (Maimonides, l.c. iii. 9). When, however, one dedicated a thank-offering or a meal-offering and died before he could fulfil his vow, his male heir might offer it and observe semikah (Men. 92a, in opposition to R. Judah; Maimonides, l.c. iii. 9). Even when the semikah was omitted a sacrifice was still acceptable; but the forgiveness obtained through it was not as complete as if the ceremony had been performed (Men. 93b; Maimonides, l.c. iii. 12). The symbolism of this custom has been variously explained. According to Philo ("De Victimis," § 4 [ed. Mangey, p. 240]), the sacrificer intended his act to imply that "these hands have done no wrong, but have performed good and useful deeds." This, however, applies only to thank-offerings and meal-offerings, and not to sin-offerings or to offerings of atonement. Some rabbinical authorities, followed by certain Church Fathers, interpreted "semikah" as meaning that the sacrificer, by laying his hands upon the victim, transferred his sins to it, and imposed upon it the punishment which his conduct had merited (Sforno on Lev. i. 5; Levi b. Gershon on Lev. i. 4). This explanation is based on the ritual associated with the scapegoat, upon which Aaron laid the sins of the children of Israel, who were thereby freed from their iniquity (Lev. xvi. 21 et seq.). 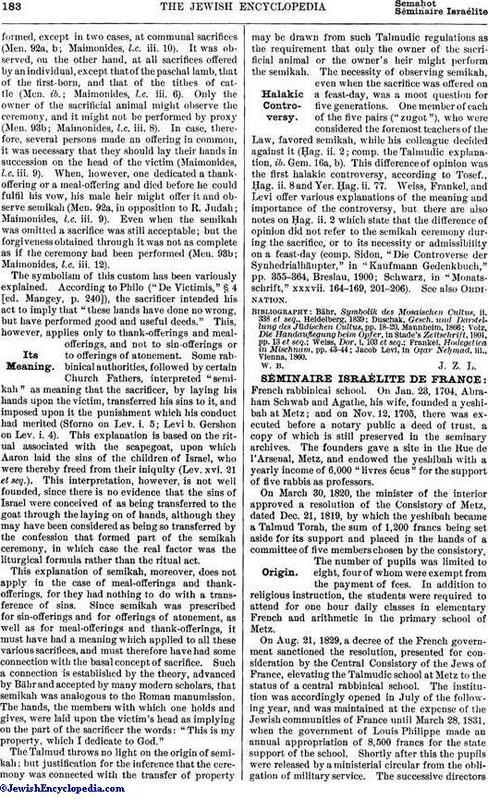 This interpretation, however, is not well founded, since there is no evidence that the sins of Israel were conceived of as being transferred to the goat through the laying on of hands, although they may have been considered as being so transferred by the confession that formed part of the semikah ceremony, in which case the real factor was the liturgical formula rather than the ritual act. This explanation of semikah, moreover, does not apply in the case of meal-offerings and thank-offerings, for they had nothing to do with a transference of sins. Since semikah was prescribed for sin-offerings and for offerings of atonement, as well as for meal-offerings and thank-offerings, it must have had a meaning which applied to all these various sacrifices, and must therefore have had some connection with the basal concept of sacrifice. Such a connection is established by the theory, advanced by Bähr and accepted by many modern scholars, that semikah was analogous to the Roman manumission. The hands, the members with which one holds and gives, were laid upon the victim's head as implying on the part of the sacrificer the words: "This is my property, which I dedicate to God." 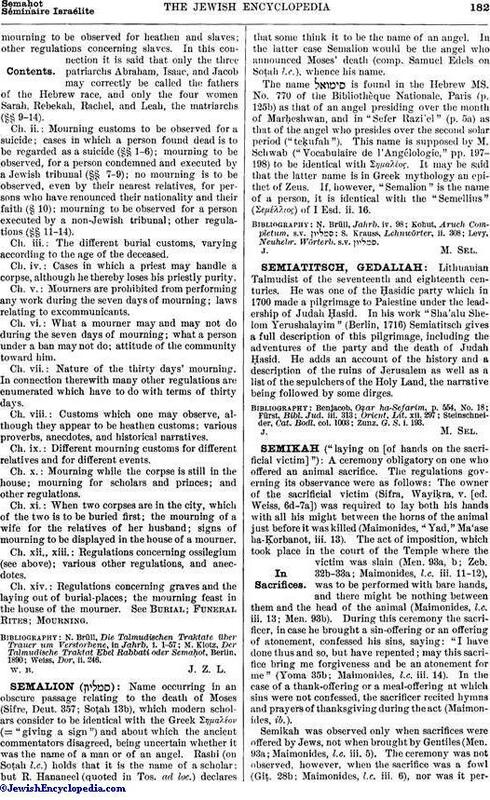 The Talmud throws no light on the origin of semikah; but justification for the inference that the ceremony was connected with the transfer of property may be drawn from such Talmudic regulations as the requirement that only the owner of the sacrificial animal or the owner's heir might perform the semikah. The necessity of observing semikah, even when the sacrifice was offered on a feast-day, was a moot question for five generations. One member of each of the five pairs ("zugot"), who were considered the foremost teachers of the Law, favored semikah, while his colleague decided against it (Ḥag. ii. 2; comp. the Talmudic explanation, ib. Gem. 16a, b). This difference of opinion was the first halakic controversy, according to Tosef., Ḥag. ii. 8 and Yer. Ḥag. ii. 77. Weiss, Frankel, and Levi offer various explanations of the meaning and importance of the controversy, but there are also notes on Ḥag. ii. 2 which state that the difference of opinion did not refer to the semikah ceremony during the sacrifice, or to its necessity or admissibility on a feast-day (comp. Sidon, "Die Controverse der Synhedrialhäupter," in "Kaufmann Gedenkbuch," pp. 355-364, Breslau, 1900; Schwarz, in "Monatsschrift," xxxvii. 164-169, 201-206). See also Ordination. Jacob Levi, in Oẓar Neḥmad, iii., Vienna, 1860.